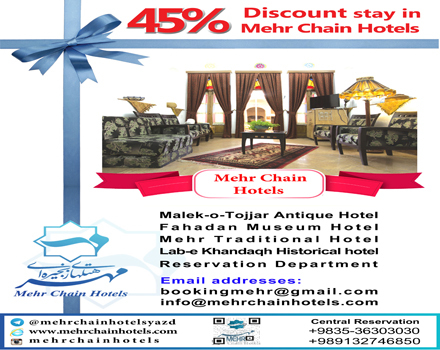 Advantages of Staying in "Mehr Chain Hotels"
The city of Yazd is the first to be entirely built of adobe .It survived the intact devastation being tagged as the most uniform historical context of the world. 750 hectares of this wonderland is filled with picturesque adobe buildings depicting the long history of the diligent people who thrived on this plateau, now these magnificent buildings have been renovated and converted to hotels. They all recall the boom years of the civilization, whispering the story to their posterity. 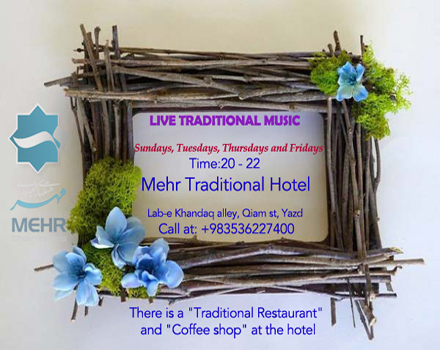 Manipulating the historical contexts and the existing potentials, Mehr chain hotel's management has commenced renovating the historical heritages and converting them into hotels, bringing about a great change in the improvement of the tourist industry. We have made every endeavor in order to regeneratethe historical heritage through families especially those who take up residence in Kavir (salt desert). One of our main goals is establishing a link between the present and the old generations so that we can put the younger generation in contact with the cultural offerings, familial relationship, household appliances and above all, the authentic Iranian identity. To achieve our goal, we have a long way to go, however, we press on regardless. Having ten different tourist agencies and hotels under the management of Mehr chain hotels' manager attempts to create a safe haven for you where you can store a sweet memory for ever. We hope our attempt will bring a welcoming change in your life and make you feel joy. A lovely way to celebrate the beginning of a lengthy winter! the greatest Persian poets of all the time, and a source national pride.